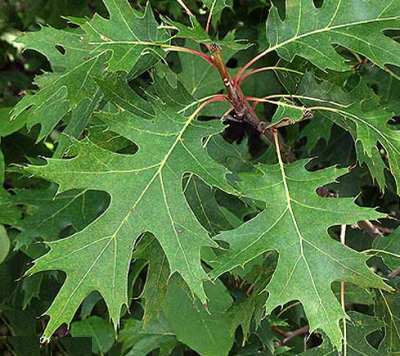 More than 300 full sibling northern red oak trees were established at Ames, TN in 2013 and are being maintained by the UT Tree Improvement Program. The plantation is protected against deer by electric fence, rabbits by tree shelters (small trees) and voles by repeated cultivation to destroy underground tunnels. To provide additional opportunities for phenotypic scoring and environmental interaction studies, much of this population has been re-propagated to the University of Missouri. A total of 965 grafted ramets are in the ground at the University of Missouri, representing 334 full sibs, plus both parents, (~2.9 grafts per clone). These trees were propagated over two different years (2013 & 2014). The following traits have been measured at the University of Missiouri planting. For each ramet (1-5 per ortet), six different leaf morphology traits were measured on each of two mature first flush leaves. This dataset represents an initial attempt to define QTL regions associated with leaf morphological traits in this species. Data collection protocols previously developed by our European colleagues for Q. robur were used. SM1 and SM2 are the parent trees. morphology, branch angle and marcescence. Genotyping of this population is ongoing. A set of SSR markers are being used for the entire population, and a subset of trees are also undergoing ddRADTag genotyping. Please contact us for more information or if you are interested in utilizing this population for research. Genotype and phenotype information will be posted here when publicly available. There are 605 SSR markers associated with 497 features in this organism.